A Texas mother is facing charges over the deaths of her two children from heat exposure after they were found locked in a car last month, police say. 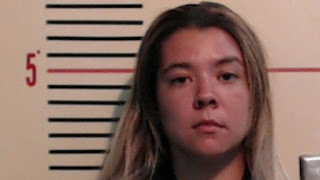 They say Cynthia Marie Randolph has admitted she shut the door to teach her two-year-old daughter Juliet a "lesson" after she had refused to leave the car. Juliet and her 16-month-old brother Cavanaugh were pronounced dead at about 16:30 on 26 May. Temperatures outside at that time were about 96F (35.5C), police say. The incident happened at Ms Randolph's home near Lake Weatherford, the Parker County Sheriff's office says. It says that "throughout multiple interviews, Randolph created several variations of the events which led to the death of her children". In her initial statements, she said her children had entered the vehicle on their own, locking themselves inside. The 24-year-old mother also said that after finding them she had broken a car window to try to save them. But she eventually admitted that she had found children playing in the car at about 12:15 on that day. When Juliet refused to leave the vehicle, she closed the door "to teach her daughter a 'lesson', thinking 'she could get herself and her brother out of car when ready,'" the sheriff's office says in a news release. It says the mother then went inside the house and smoked marijuana before falling asleep for between two to three hours. She has also admitted that she broke the car window to make the deaths look like an accident, the release says. Ms Randolph is now facing two felony charges of injury to a child causing serious bodily injury.